A truly charming cottage with a double garage in the heart of this delightful West Leicestershire village. Extended and beautifully renovated with a stunning manicured garden. Convenient for schools and local amenities. Very easy access to Leicester, County Hall, Glenfield Hospital. Ideal commuter location with nearby road and rail links, motorways and East Mids Airport approx 16 miles away. A truly charming cottage with a double garage in the heart of this delightful West Leicestershire village. Extended & beautifully renovated with a stunning manicured garden. Convenient for schools & local amenities. Very easy access to Leicester, County Hall, Glenfield Hospital. Ideal commuter location with nearby road & rail links, motorways and East Mids Airport approx 16 miles away. Located in the very heart of the delightful West Leicestershire village of Glenfield is the skilfully extended and much improved Ploughwheel Cottage. Originally 2 cottages built approximately 160 years ago, the current owner has lovingly and meticulously extended, restored and transformed the property into a simply beautiful family home. Set back from the main road on a separate access road behind attractive period bollards with chain linking, 33 Main Street with a driveway for 2 cars providing access to the large double garage is convenient for schools and local amenities and perfectly positioned for buyers needing to travel around the county and beyond. Set under an open oak framed porch, the front door leads through a small vestibule into the surprisingly spacious reception hall with light oak strip flooring, matching doors into the ground floor rooms and a staircase rising to the first floor. The oak flooring flows through a pair of double doors into the magnificent, extended lounge with a feature fireplace and dark grey patio doors providing access onto the patio and stunning views of the beautifully landscaped gardens. The lounge opens into the orangery style garden room which has a roof lantern and matching bi-fold doors to 2 sides allowing the room to flow seamlessly into the garden. A door leads off the lounge into the formal dining room with a window to the front, a restored fireplace and space for a family dining table with a further door leading into the dining kitchen. No expense was spared when the kitchen was refitted with a range of modern base and wall units including an illuminated display area and a range of quality appliances. A Belfast sink and bespoke granite work surfaces completes the luxury feel of the kitchen with a door leading back into the hall. At the other side of the hall there is a downstairs wc comprising a toilet, sink and ample storage cupboards. The spacious utility room has a range of quality base and wall units, a sink and space/plumbing for a washing machine and a door leads out onto the drive. The quality theme continues upstairs with the oak flooring extending onto the spacious landing which provides access to 3 double bedrooms and a family bathroom. The master bedroom is impressively spacious with 2 separate runs of fitted wardrobes and an en-suite shower room comprising a toilet, sink and double sized walk-in shower enclosure. Bedroom 2, also of generous proportions with enough space for a double bed has an original fireplace and a range of fitted wardrobes. 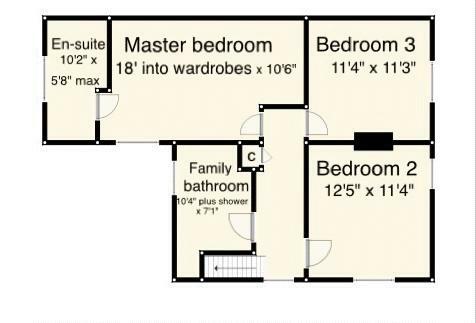 The third double bedroom with a range of fitted furniture is used by the current owner as a study. The family bathroom with a white suite comprising a toilet, sink, shower cubicle and free-standing bath completes the first floor accommodation. The gardens are without doubt a particular feature of the property. The front has a small walled area with a range of plants and shrubs and a block paved drive providing parking for 2 vehicles and access to the garage. A timber pedestrian gate provides access to the private walled rear garden. The rear garden has been stunningly landscaped with a block paved patio, shaped lawns, timber pergolas and mature well-stocked borders. 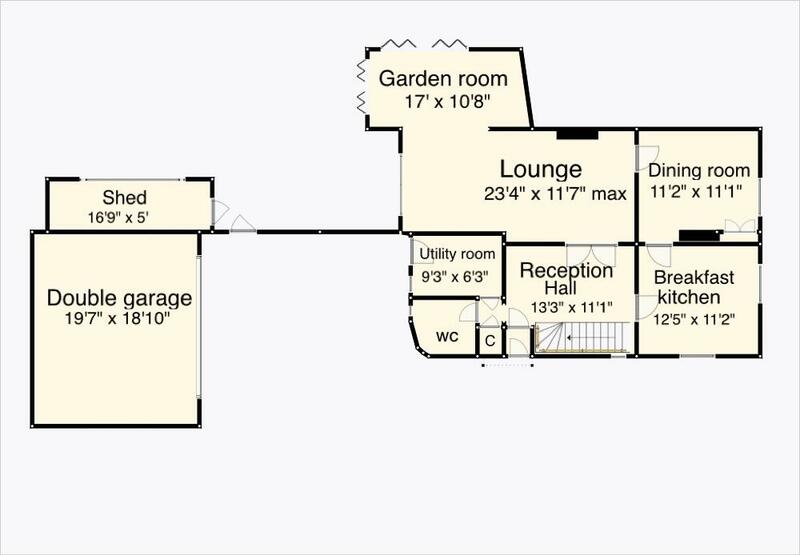 The large double garage has an electric roller door with an attached outdoor store/potting shed with light and power and a large window overlooking the garden. Glenfield is a Leicestershire village in the Blaby district of the county lying about 4.5 miles west of the city centre. Having grown over the years the village now joins with the city on its eastern border yet retains a village feel as well as its own individual identity. There are a number of schools in and around the village catering for children of all ages and amenities including doctors, dentists, a good range of shops including a co-op superstore and petrol station. The village has a variety of pubs restaurants and take-away food outlets as well as a public library and Church Hall. The village remains extremely popular today due in part to the proximity of the A563 outer ring road and the A46 Western Distributer Road which allow easy travel around the county and access to junctions 21,21a and 22 of the M1 motorway, and the A50 being a main arterial road into the city from the north. Leicestershire’s County Hall is located on the northern border and the village lends its name to the Glenfield Hospital which is just over the city boundary. The current owner feels privileged to have called this stunning historic cottage "home" for the last 42 years and it’s with a heavy heart that he has decided that the time has come to move on to pastures new but he feels that the time is right to look for someone a bit smaller.
" I had viewed so many houses during our search, but even though it bared no resemblance to the property I have today, I new as soon as we walked through the front door of Ploughwheel Cottage, that I had found my new home." Roy recalled. Originally 2 cottages built some 160 years ago, it has been transformed over the years into a truly stunning, deceptively spacious family home. "When friends visit for the first time, they are amazed by the size of the rooms" Roy continued. "I am frequently complimented on the lounge and garden room which has been described as jaw dropping." "It is probably the garden that I will miss the most. Very cleverly designed it has been my pride and joy for many years and has provided the backdrop for many an outdoor party during the warmer months." " One of the main considerations when I bought the cottage was its central position in the village, all the local amenities including shops, pubs and restaurants; doctors dentists and opticians are all on the doorstep and the road networks make travel in and out of the village so easy."